The main events today centred around the Kangyur, the Tibetan collection of sutras or the written record of the words of the Buddha. This is covered in a separate feature. Novice monks and nuns did not go to the Mahabodhi stupa. 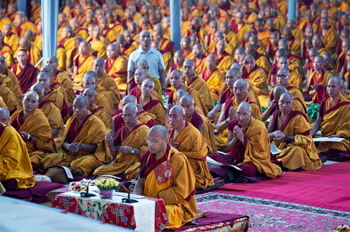 The Mahayana sojong vows at the Monlam Pavilion were given by Khenpo Dönyö. While the Kangyur procession was under way at the stupa, those at the pavilion recited the Menlha (Medicine Buddha ritual). The current troubles in Tibet mean that this year’s Monlam prayers for the well-being of Tibet have taken on an urgency and great significance. Each year, His Holiness unfailingly attends this session. The prayers in this section were written mostly by His Holiness the Fourteenth Dalai Lama. There must have been very many heavy hearts amongst the monks and nuns as they recited them, especially those whose families are still in Tibet. Pilgrims arriving from Tibet have brought with them stories of the suffering there. The Gyalwang Karmapa himself, in recent public statements, has hinted that the situation in Tibet, of self-immolations and increasing crackdowns and repression by the Chinese authorities, weighs heavily on him. As tensions escalate, instead of showing concern and trying to understand the causes of the situation, the Chinese authorities respond with increasing force and oppression. Each new report of a Tibetan death brings me immense pain and sadness; three in a single day is more than the heart can bear. I pray that these sacrifices have not been in vain, but will yield a change in policy that will bring our Tibetan brothers and sisters relief. As he recited the prayers, the webcast camera caught him grim-faced, staring steadfastly ahead. I am sure that within this new great encampment, those aware of the tragic situation in Tibet, were praying from the depths of their hearts. Early evening, the Gyalwang Karmapa went to the Monlam Pavilion to supervise the reorganization of the stage and rehearsals for two upcoming events: the Long Life Offerings to H.E. Tai Situ Rinpoche and H.E. Gyaltsap Rinpoche, and the Marme Monlam. Both will be held on the eighth and final day of this year’s Monlam. The rehearsals continued long into the night.